Clearwater, Florida chiropractic physician, Dr. J.D. Decuypere, specializes in alternative health approaches to a wide variety of health problems, including chronic health conditions, high blood pressure, insomnia and allergy elimination and treatment. 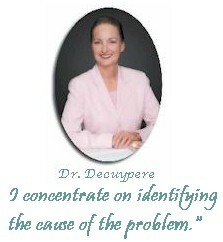 In addition to her 30 years of active practice, in the last few years, Dr. Decuypere has engaged intensively in research to address and find solutions to certain common but resistive health problems where traditional treatments prove disappointing and often non-effective, and finding solutions to each of them with great success. It is this approach, and Dr. Decuypere's focus on treating causes rather than symptoms, that makes her one of the most sought-after health practitioners in the country. If you need help, please call us at (727) 449-8080 or visit us in our offices.